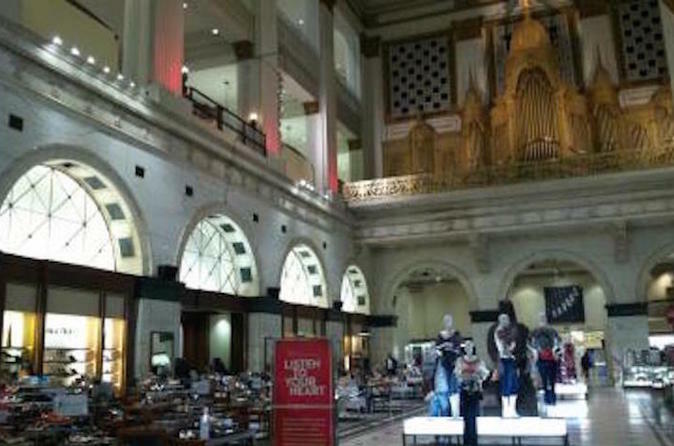 Enjoy a guided small-group tour of Macy's Center City, a true American original in Philadelphia! This tour is an experience like no other with highlights of the breathtaking Wanamaker Building, Wanamaker Grand Court Organ, and the Grand Court Eagle. After the tour, receive a 10 percent Visitor Savings Pass to shop and dine through this historic 3-floor building, filled with the best in fashion for the whole family, cosmetics, shoes and home goods. This 45-minute walking tour starts at our Visitor Center on the 1st floor—after a short introductory the tour leads into the Grand Court where you will learn the history of two great retail pioneers, R.H. Macy & John Wanamaker. After 10 minutes, the group will learn the history of the world renowned Wanamaker Organ and later, the group will get to see the Organ console on the 2nd floor. During the tour, the tour guide highlights the historic Wanamaker Building’s architecture, the iconic Eagle in the Grand Court, Wanamaker Prayer Room, Greek Hall and the remaining visuals of the Egyptian Hall on the 3rd floor of Macy’s Center City. Escalators are used to transport from floor to floor, however elevators are available as well for wheelchair accessibility. Complete your tour with a 10 percent Visitors Saving Pass and spend some time shopping throughout the historic store.